Additive manufacturing can be a tricky, complicated process. But complexity has its advantages. 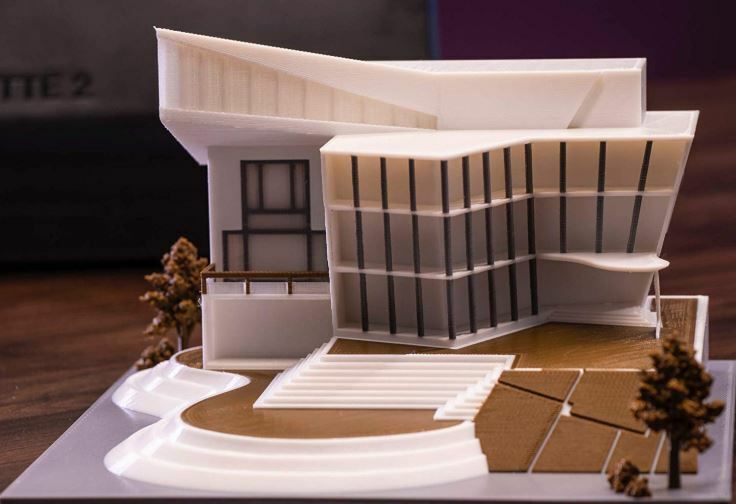 With the right adaptations, you can take existing 3D printing infrastructure and make it more. Even with printers that were not specifically designed to be adapted. Great 3D printing can get even tougher when you start to have higher standards for your prints. Especially if you expect precision and detail, not only in shading and coloring but in texture. Few 3D printers really excel at everything, and being able to patch over small little weaknesses can be stunningly useful. The Mosaic Palette 2 Pro makes that process more accessible. Its design is somewhat ingenious. Instead of requiring your 3D printer do extra work, the Palette 2 gets your print filaments to do more. And the Palette is a totally self-contained system, which is what allows it work with a wide number of 3D printers. Once it’s up and going, the Palette 2 Pro can help layer your prints with colorful ABS, PETG, or PLA. It uses a filament run-out detection feature, ensuring at least one of the four onboard sensors are always keeping your printer in operation. That also helps the Palette 2 can combine several spools with ease. But clearly, there are still many questions left unanswered. The Mosaic Palette 2 Pro is slightly on the heavier side, weighing 7.9lbs. Its supported feedstock size fits a 1.75mm FFF filament, quite standard for these types of products, which are intended to blur the lines between consumer grade equipment and professional equipment. And physically, its dimensions measure 9 x 8 x 3.3-inches, making it a fairly compact addition to any workspace. 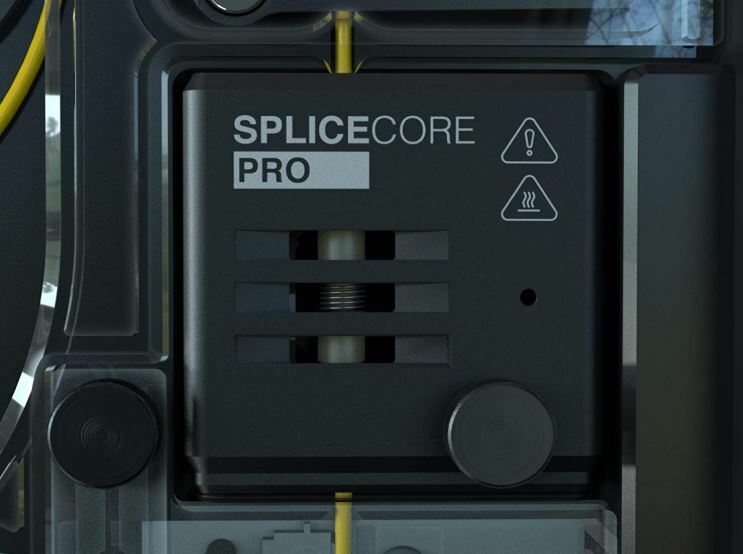 Inside the solid state splicer, Splice Core Pro 1.0 technology works together with a 32-Bit ARM processor. Together, they direct six Nema 17-Stepper motors to add some grizzly firepower to your 3D printer’s physical capabilities. But what truly distinguishes the Palette 2 Pro from the Palette 2 is the inclusion of Splice Core Pro. Without going into excruciating detail on the mechanical differences involved, it’s safe to say they are quite significant. 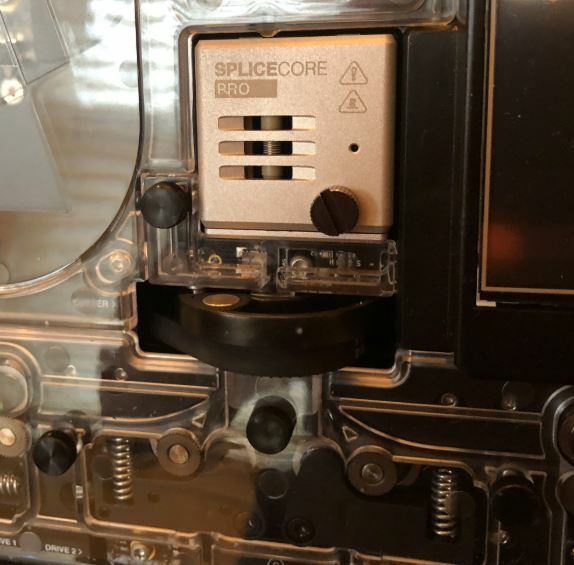 Each splicer is machined from aluminum, to help provide better cooling speeds and faster splices. The inclusion of the Splice Core Pro module actually helps make the Palette 2 roughly 20% faster. It might not sound like a massive difference, but when you’re working on a larger project, that sort of speed difference can be night and day. The Mosaic Palette 2 Pro does not require any calibration, which makes setup pretty simple. Automatic calibration occurs on your first print, and calibration is designed to only improve with use. And the Palette 2 Pro includes a stand and mounting plate, but it can also be laid flat on a table if you don’t want to bother with an elaborate setup. 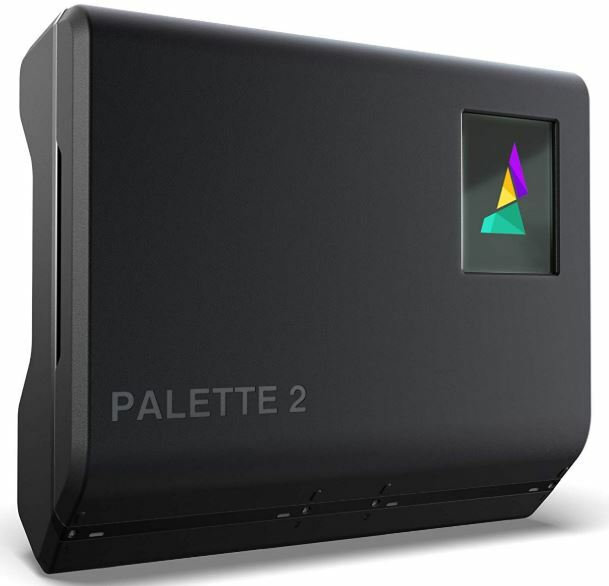 The Palette 2 Pro uses a buffer system to help feed its filaments into a print job. The Palette 2 Pro doesn’t push filaments into your print job. It merely offers the filament for use, and allow the printer to pull it away, similar to a spool of yarn. The Mosaic Palette 2 Pro is capable of accepting four filaments at once. To get started, you simply place the spools of filament on the filament stand. And there’s no need to worry about rigging your own stand because an adequate stand is included with the Palette 2 Pro. Once you’ve got your filaments in position, you feed them into the Palette 2’s input drive. That’s basically as simple as plugging in a cable. From here, you can essentially sit back and watch the magic happen. Depending on the kind of work you’re doing, you may monitor your progress or the consumption of filaments, as the Mosaic Palette 2 continues to make-and-use those observations in real time. It’s now when the Palette 2 Pro will cut, cool, heat, and splice your filaments into a single strand composed of the once separate segments. Whether you’re trying to create advanced prints or simple ones, this type of design is clearly ideal for printing with multiple materials. You may find especially good results by mixing PLA and ABS, and it’s fair to say you’re really only limited by your imagination, patience, and budget. Most of the time, the Palette 2 Pro does not require a babysitter. You can generally give it a task, and then let it get to work with confidence the task will get done. But for those internment moments where you’re setting up and configuring your next print, the 3.2” full-color touchscreen is rather simple to use. Being composed of 240 x 320 pixels, the screen isn’t great, especially for someone who’s used to staring at smartphone screens. But you’re not going to be looking at high definition photos on this display, and it provides all the clarity that’s necessary for operation. Much of that clarity is due to extensive use of color labeling. With such great support for color, you might expect a beautiful user interface. But the user interface is not aesthetically remarkable at all. However, it’s terribly easy to use. You probably won’t be confused by what function the stop-sign button serves. The Mosaic Palette 2 Pro provides several print modes, which you can access from the touchscreen. The most prominent among them include Pattern Mode, Gradient Mode, and Random Mode. Whether you’re trying to create specific patterns or you’re simply trying to add texture, these modes allow you to churn out some pretty stylish skins with only a few taps. On the software side of things, ease of use is equally steady. That’s largely because of the inclusion of support for the CANVAS platform. 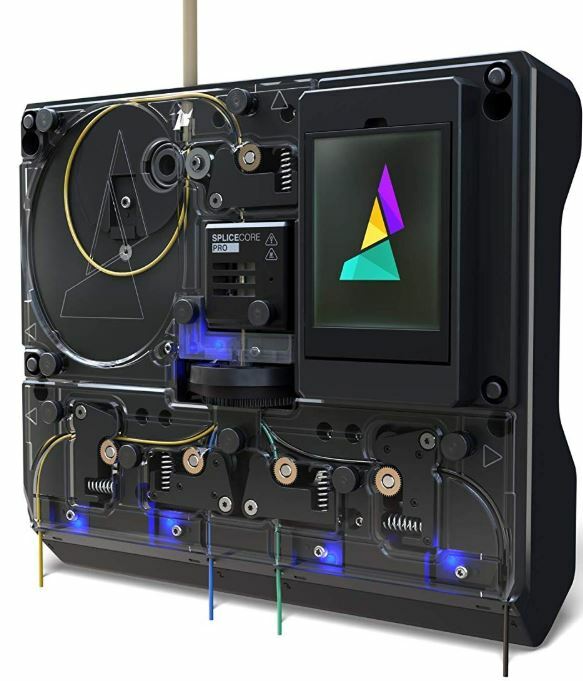 It provides a highly direct, highly usable interface, allowing you to upload your favorite splicer profiles and streamline the process of printing 3D content with multiple materials. Within the software, you can use layer batching, infill transition, apply color to 3D models, and similar time-saving features. That includes rather extensive support for textures and even some strong free form tools. Using them, you can save and track your prints and then share your designs online. While this type of software isn’t exactly a full-fledged replacement for a 3D modeling suite, it does extend what the Palette 2 Pro can offer. In addition to the Wi-Fi connections through Canvas Hub, it’s possible to upload your print data using a USB connection or an SD card. The USB connections are high-bandwidth ports, and you won’t struggle to fit almost any type of SD card inside the Mosaic Palette 2 Pro. Though if you start using the especially small ones, you may need to break out an adapter. The reason why the Palette 2 can work with so many direct-drive printers and 3D printers is because it doesn’t require some kind of elaborate installation. It’s universal enough to be incorporated into the majority of all non-industrial 3D printer setups. And that simplicity carries over into several other aspects of design, including maintenance. Mosaic designed the Palette 2 Pro with the intent of maintenance being a tool-free process. As a result, it’s possible to access all the parts which may require maintenance with minimal effort. You’ll just have to go through a magnetic top-casing and some thumbscrews. If something needs to be replaced, you’ll need to swap out parts in a process that’s about as complicated as moving two Lego bricks together. The Mosaic Palette 2 Pro is compatible with most 1.75-filament 3D printers. Among the most prominent names supported, you’ll find the Raise3D N-Series, gCreate, CR-10, Original Prusa MakerGear, Anet, BEEVERYCREATIVE, RepRap, Printrbot, SeeMeCNC, Wanhao i-Series, TEVO, and others. The Mosaic Palette 2 Pro is also compatible with Mac, Windows, Linux, and Ubuntu. In addition to the software already mentioned, Mosaic Chroma is also included. It extends control over the Palette 2 Pro to include offline support. 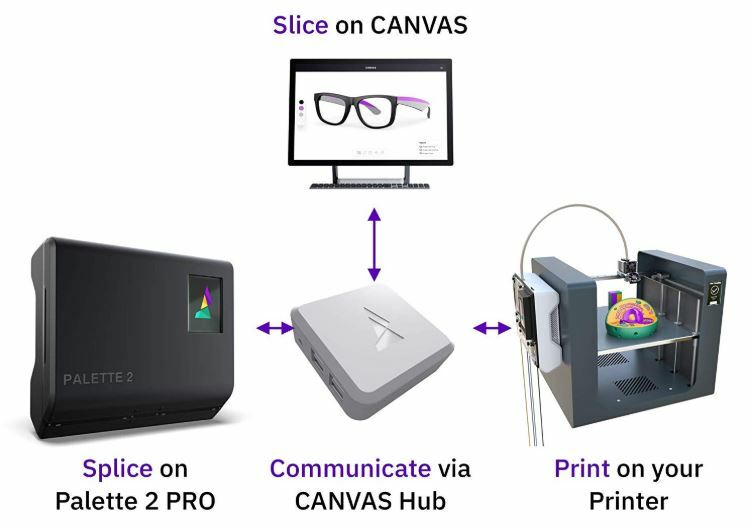 With respect to its functionality, it’s functionally adjacent to CANVAS 3D printing software. Combined, you can use them ensure the Palette 2 Pro is always under your control, even if you want to setup a secure home network. The Mosaic Palette 2 Pro is picky. While some 3D printers are capable of operating in slightly chilly temperatures, the Palette 2 Pro needs an ambient operating temperature between 60-86°F. In addition to its mounting equipment, the Palette 2 Pro includes a USB cable which can be used to help update the device, a handful of spare parts, and a power adapter. The included power adapter inputs are supported by the USA, UK, AU, and EU. The spares are for the components most likely in need of replacement within the next few years, which allows you to remain self-sustained for quite some time. Who Should Choose the Mosaic Palette 2 Pro? 3D printing can be complicated, especially if you want real depth in the level of specialization you can achieve. The Mosaic Palette 2 Pro does its best to keep things simple. Having this kind of feeding system provides quite a bit of raw mechanical power for your 3D printer to work with. It can be used to help you work on almost anything you might be printing, from phone cases to rubber watchbands. That’s because it’s unquestionable that the Mosaic Palette 2 Pro is great for making detailed, color-rich 3D textures and skins. The features that make it all possible are approachable to amateurs but have the depth of customization necessary for professionals. That kind of duality is really what makes the Mosaic Palette 2 Pro such a powerful tool, for both power-users and pros. Because the Palette 2 is compatible with the CANBAS Hub, your connectivity options are essentially limitless as well. The range of connectivity options isn’t going to disappoint anyone, though support for Bluetooth could have sweetened the deal. Posted in Blog, Tech Corner and tagged #3d Printer, #3dprinter, #announcement, #blackfriday, #cheap, #christmas, #console, #facebook, #mcsc, #messiah, #News, #TheMessiah, CANVAS 3D, Mosaic Palette 2 Pro.